The Kern County Basque Club is still needing help filling spots to work the Kern County Fair September 21-23, 2017. Help is needed in all areas: front, bar, and kitchen, so if you are able to help out, email Joe Iturriria. If you are in the area, stop by and support your Basque friends at the event. The Zazpiak Bat Basque Club, in Reno, will host its annual Fall Picnic this Sunday, September 17th at Rancho San Rafael Park, at the Peavine Picnic Pavilion. The event begins at 11:30, with lunch being served at 12:30pm. Lunch will include BBQ lamb, Basque beans, vegetables, salad, bread, cheese and wine. Cost of the meal is $10 for adults and $5 for children under 12 with a RSVP, and $15 for adults and $7 for children without an RSVP. After lunch there will be plenty of time for kids games, horseshoes, volleyball, or Mus, or just relaxing with your Basque Friends. Complete information is available here, or visit them on Facebook. 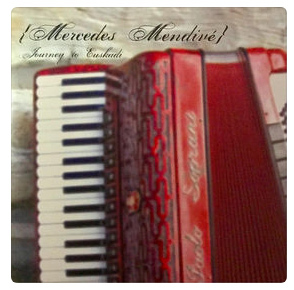 We are pleased to announce that Mercedes Mendive's album Journey to Euskadi is now available on iTunes. Mercedes who is originally from Elko, is known as an "indefatigable worker," to some and since her return to her hometown, she has not only been working hard with the local dance group, and club, she has also traveled to several Basque communities to provide music for their events. More recently she has become one of Elko Euzkaldunak's NABO delegates. Zorionak Mercedes!